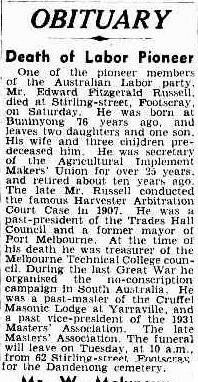 One of the pioneer members of the Australian Labor party, Mr. Edward Fitzgerald Russell, died at Sitrling-street, Footscray, on Saturday. He was born at Buninyong 76 years ago, and leaves two daughters and one son. His wife and three children pre-deceased him. He was secretary of the Agricultural Implement Makers’ Union for over 25 years, and retired about ten years ago. The late Mr. Russell conducted the famous Harvester Arbitration Court Case in 1907. He was a past-president of the Trades Hall Council and a former mayor of Port Melbourne. At the time of his death he was treasurer of the Melbourne Technical College council. During the last Great War he organised the no-conscription campaign in South Australia. He was a past-master of the Cruffel Masonic Lodge at Yarraville, and a past vice-president of the 1931 Masters’ Association. The late Mate Master’s Association. The funeral will leave on Tuesday, at 10 a.m., from 62 Stirling-street, Footscray, for the Dandenong cemetery. 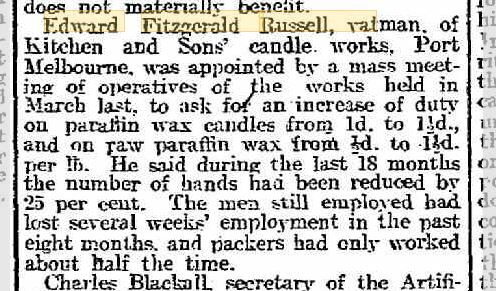 Edward Fitzgerald Russell, vatman, of Kitchen and Sons’ candle works, Port Melbourne, was appointed by a mass meeting of operatives of the works held in March last, to ask for an increase of duty on paraffin wax candles from 1d. to 11d., and on raw paraffin wax from ½d. to 1½ d. per lb. He said during the last 18 months the number of hands had been reduced by 25 per cent. The men still employed had lost several weeks’ employment in the past eight months, and packers had only worked about half the time. The next article mentioning Edward was an article about the Harvester Commission. The Harvester Commission held another sitting at Parliament House to-day. Edward Fitzgerald Russell, general secretary of the Industrial Implement Makers’ Union, further examined by Mr. McDougall, said he did not believe in the contract system in shops, as men on the contract system made the pace, and so created two sets of payment. The present system of improvers gave a boy no chance to gain systematic training, as specialisation prevented that. His contention was that those who were engaged in assembling the parts were experts, as the parts would not always fit and required mechanical skill to adjust them. There was evidence of a manufacturer shifting his factory in order to avoid unfavourable wages board provisions. By co-operation a saving of 17 per cent. could be affected on the cost of distributing harvesters to the benefit of the farmer and the employes alike. The evidence given before the previous Tariff Commission by Mr. Weichardt, in which he estimated the cost of manufacturing a harvester at about £37, and £65 as a fair price for cash sale, was recognised by the union as a fairly correct statement. Mr. Chanter – Could the union, as a body get information as to the cost of machines? We have tried to get information, and have met with the same result every time. The men were afraid to give it for fear of losing their employment. Mr. Sampson – Do you think it would be honorable to get information in that way? The Witness – Yes, I do, in the interests of the community. There can be no fidelity between employers and men engaged in a class struggle. Mr. Sampson said he did not consider Mr. Chanter’s question was a proper one. Mr. Chanter – I do. In my opinion the suggestion is not dishonorable. Mr. Sampson said it was an underhand way of getting information. Mr. Chanter objected to the word underhand being used. Mr. Sampson adhered to his opinion that it was not a proper way for the Commission to get evidence, and Mr. Chanter continued to differ from him. Alexander Picken, representative of Nicholson & Morrow, re-examined, objected to give a detailed statement of wages to the Commission. He did not see how it would help the Commission, and his firm did not wish to parade their business details before the public. Their rates were higher than those fixed by Mr. Justice O’Connor. The Chairman – You have an export trade? – I submit that that is no part of the business of the Commission. I have not come here with the intention of giving information on that point. You decline to give us any information about the export trade? – Certainly. I have answered all the questions I consider it necessary to answer about the export trade. I take it that it is an enquiry to see whether or not the manufacturers sweat their employes and rob the farmers, and I think sufficient evidence has been given to show that that is not the case. Is it right to ask firms to expose their private affairs? The Chairman – It appears to me you have come here with a determination not to answer any question. The Witness – I asked you to devise means whereby this information you asked for would be treated confidentially. The Chairman – My answer to that was that it was a public enquiry, and that evidence could not be given in that way. The Witness – If the information was given confidentially and not circulated amongst our opponents I would not object. 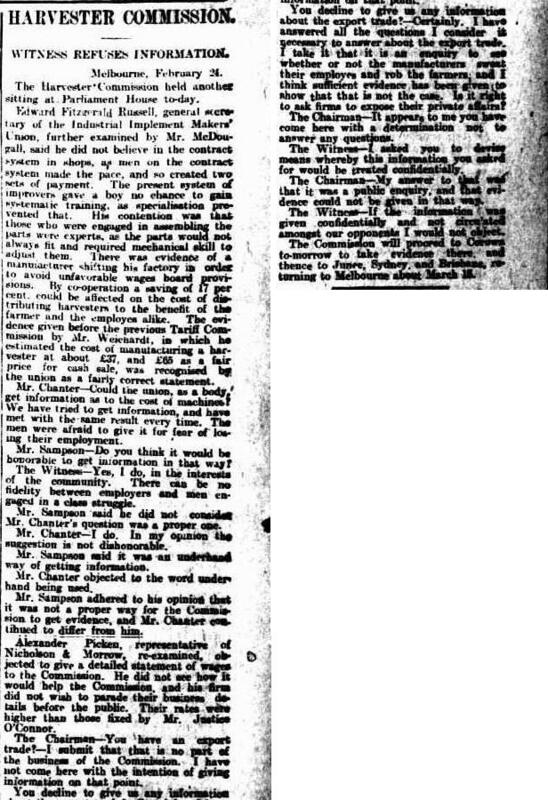 The Commission will proceed to Corowa to-morrow to take evidence there, and thence to Junee, Sydney, and Brisbane, returning to Melbourne about March 15.